Here's one card made for two challenges. Our Daily Bread Designs and Doodle Pantry DPDC32. As followers of my blog know, I just love the pre-colored digital images from Doodle Pantry. And this colorful parrot is definitely a favorite. I also want to give ODBD a thankful shout-out for sponsoring a box of Operation Write Home cards sent to our deployed military for every 25 cards created for their challenge. Thanks so much for your continuing support. Love this bright and delightful card and I agree, Doodle Pantry's coloured images are wonderful! Glad you could join us for the DPDC#32! Doodle Pantry, ODBD, OWH = three of my favorite things ! Very cute card. I too love the pre-colored digis. Thanks for joining us for the Doodle Pantry challenge. Good luck. Love the bright colors which are perfect with this image. Adorable card! Thanks so much for joining us for this month's Doodle Pantry Digi Challenge. This is so bright and pretty!! Fun card! Thanks for playing along with Doodle Pantry Digital Challenge 32!! I just love the pre-colored images too. They make putting a card together very easy. Love your layout and fun designer paper. Thanks for joining us for the Doodle Pantry challenge! Thanks also for supporting OWH! 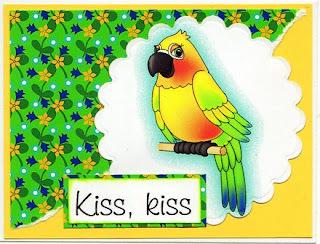 Beautiful card...I love the design you created using the colored image. Thank you for playing along with our challenge this month! Bright cheery - and scallops - WOW - don't you just love the precolored images - they are so great to work with. Thanks for joining us at DPDC 32 this month. I love this parrot too, so bright and fun. I'm also a HUGE fan of the pre-colored digis, they are such a time saver. Thanks for joining us at the Doodle Pantry Digital Challenge. Love the bird and the shadowing you did around it. It is surly your focal point. Thanks for joining the challenge. What a bright and cheerful card! I too love Laurie's precolored images! You did a fantastic job with this one! Thanks for joining us at DPDC32! 26 Cards from one 6x6 Designer Paper Pad!